Bangkok is spectacular and beautiful to look at in the nighttime. That is why skybars are so popular here. The Vertigo is my favourite rooftop bar here. 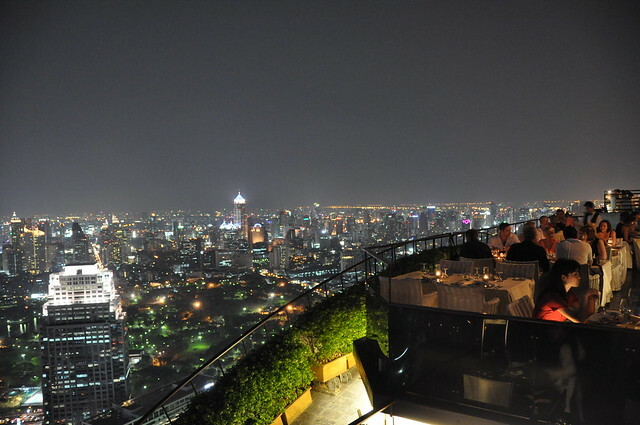 It is located on top of the Banyan Tree hotel and very classy. And actually, the prices for drinks are quite good considering the view. I would describe the feeling kind of as being on a ship that slowly and surely hovers over the city. It’s beautiful, because at night you can see the starts above – and the many lights below on the streets. When you go there, it’s good to know about the dresscode: proper shoes and long pants. But even if you show up in flipflops and sweatpants, they will offer you shoes and pants for free, they won’t send you home. If it’s a rainy day, be sure to call in advance to check if they open. Since it really is 100% open air, they close when it’s raining. As far as prices go – a drink usually costs around 300 baht. That’s not cheap, but considering the location, the friendly, professional staff, the amazing view, the nice ambience… that’s a really fair price. Out of all the friends that I brought here, there wasn’t a single one that didn’t like it. If you come to the end of your Bangkok sightseeing experience, then this is a great place to wrap it all up. What’s more – from what I heard, the owner of the hotel Banyan Tree are really good guys.